News flash: It’s July. If you’re like me, you’re slightly confused about how the first half of the year went by so quickly. Which is why I figured it’s the perfect time to slow down and take stock of where our wardrobes are and where we want them to be through the lens of slow fashion. What is slow fashion, you may ask? It borrows many ideas from the slow-food movement, but it’s applied to the fashion world. Let me explain. Slow fashion is about consuming and creating fashion consciously and with integrity. It connects social and environmental awareness and responsibility with the pleasure of wearing beautiful, well-made, and lasting clothing (as compared to the immediate gratification of fast fashion). We made a Venn diagram graphic to help visualize the different components of the slow-fashion movement. 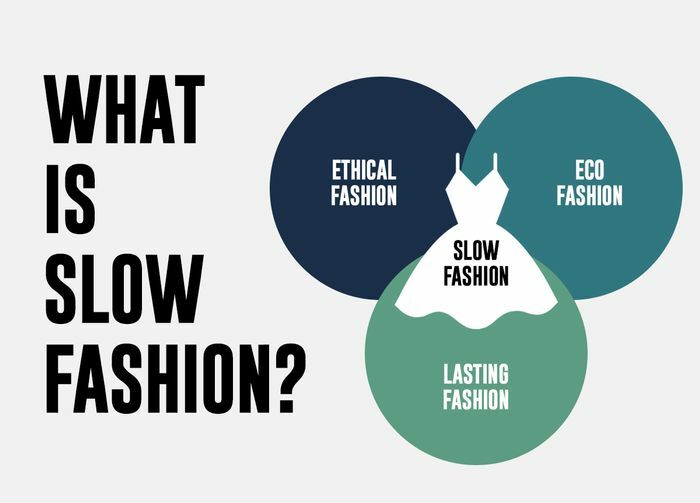 As the graphic shows, slow fashion is the intersection of ethical, eco, and lasting fashion. From my point of view, a piece of clothing or a brand doesn’t necessarily need to check off all three boxes to be considered “slow”, but the more an item or a brand encompasses these three things, the closer it comes to a true embodiment of slow fashion. Ethical Fashion concerns human and animal rights. It is about fair treatment and respect for the people employed to create the clothing. It also touches on providing people with equal opportunities. For example, if a brand wants to create basket bags with a design native to a particular area, the ethical choice would be to provide job opportunities by employing local artisans to make the bags, rather than having them mass produced at a factory that has no relation to the product. A brand may also be ethical in relation to animal rights by choosing to create vegan apparel. Eco Fashion concerns the impact of clothing production on the environment. Brands can be ecologically minded by using local materials and resources to create their product, thus reducing the environmental impact of transporting materials. It also involves manufacturing techniques that are eco-friendly, including clothing production with new sustainable fabric materials, but it also includes items made from reclaimed fabric, secondhand pieces, and vintage. Lasting Fashion concerns the garment itself and slowing down the clothing consumption rate. Garments that embody this sphere of the Venn diagram are made of high-quality materials, are built for longevity, and eschew passing trends. We all know the phenomenon of having a closet full of items but feeling like you have nothing to wear. If you have too much stuff, especially too much cheaply made trendy stuff that isn’t truly your style, the individual items don’t mean as much. This category is also about keeping traditional methods of clothing making and dyeing techniques alive that provide meaning and value to the clothing we wear. Now that we’ve had a crash course in the slow-fashion movement, here’s how we’ll be tackling the topic. For our original shoots, we have our monthly celebrity cover with Zoey Deutch featuring all slow brands, an all-vintage story with vintage curator Sami Miro, and a story highlighting how our editors wear O.G. slow-fashion brand Patagonia. Our editors will also bring their voices to stories like our giant slow-fashion shopping guide, what it’s like to be on a month-long shopping moratorium, how to outsmart the trend cycle, and more. We also aim to celebrate slow fashion not just in the month of July, but as an ongoing theme infused throughout our content going forward. We promise to feature an ever-increasing number of slow brands, and while this doesn’t mean we’re forsaking fast fashion, we want to provide a more balanced perspective on being a smart clothing consumer. Similar to fast food, we’re also cognizant that fast fashion is usually more accessible and at a lower price point than slow fashion. We think slow fashion should be a choice everyone can make, so we will show affordable slow brands alongside their more expensive counterparts. Lastly, I’m excited to announce that we’ll be bringing an IRL component to our editorial programming this month with an editor closet sale in Los Angeles. If you’re local to L.A., you can come to meet us and give our gently worn items a longer lifespan—all proceeds are going toward sustainable fashion development. See you there!